A few weeks ago, on the 11th of December 2004, Smt. M.S. 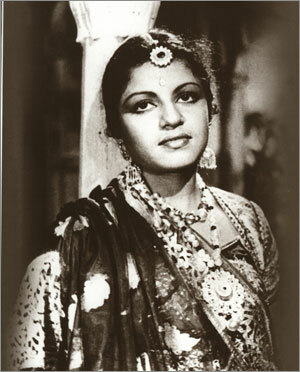 Subbulakshmi passed away at the ripe old age of 88, after ailing for some time. In this article I wish to offer a tribute to this great and remarkable lady. 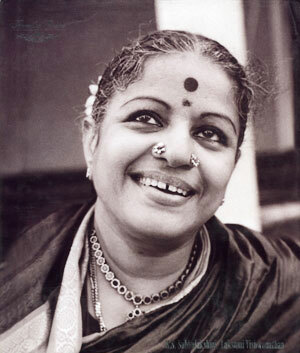 M.S., who became a legend in her own time, has often been hailed as the Queen of Carnatic Music. That she indeed was, but she was much more; she was, to put it simply, a wonderfully good human being, representing the best of Indian womanhood. People talk of saints who sang their way into the Heart of God. If ever there were such persons, then M.S. would surely be in their ranks. For the benefit of those who are not familiar with this extraordinary lady and the exquisite manner in which she rendered songs breathing Bhakthi into every syllable and note, let me offer a brief profile. M.S. was born in the temple city of Madurai, and received her first training in music from her mother. Her training was in the strict tradition of Carnatic music. Blessed with a good voice, as a young girl M.S. sang in temples. Soon people began to take notice of her, and she made her first recording at the early age of 13 or thereabouts. We used to have that record in our house. In those days, Tamil films were almost entirely mythological with a generous quota of songs rendered in good classical style, and inevitably, most singers ended up in films. No wonder M.S. too acted in a few films. Of these, the most famous was unquestionably Meera, shot in the mid-forties and released just as the Second World War ended. If I am not mistaken, that film as indeed many films in which M.S. acted, was directed by an American named Eliis R Duncan. Meera was made first in Tamil and then remade in Hindi. Indeed, it was the Hindi version of Meera that made M.S. into an all-India figure as early as 1948. Meera might not be a great film in technical terms or acting, but it was THE film to portray Bhakti, and it seemed as if God had created M.S. to play that part – of that there cannot be any doubt. It was M.S. all the way in that film; all the other characters were purely incidental and mere excuses for the narration of the story – by the way, there was no hero! that Swami had a set of Meera records and also incidentally the only gramophone in Puttaparthi in those days. He apparently used to occasionally play these records in the Old Mandir. I cannot entirely vouch for this story but this much I can confirm – Swami knew the Meera songs and in fact, He even quotes a particular line in some of His Discourses. Bhakti often finds expression in singing. There are four kinds of devotional songs. In the first category, the attributes of God are extolled (Gunaganamu). In the second type, the Glory of the Lord, as revealed in His miracles, is praised (Leelaganamu). One can also sing with feeling (Bhavaganamu). In the last type, the song revolves around the various names of the Lord (Namaganamu). Music is melodious and pleasing to the ears. This is the reason that during Nagarsankeertan in the morning, even people who do not know music join in the singing. Whether one is an atheist or a theist, one forgets oneself the moment one hears melodious music. Music is not only a vehicle for the description of God’s Glory and Leelas, but also elevates and produces a feeling of ecstasy. Music always enthrals, and many are the Bhaktas who have attained Liberation through music. Music is the grand road to Mukthi (Liberation). Music makes the devotee forget himself and get totally immersed in Divinity. Please note the last sentence of the quote. I shall repeat it: Music makes the devotee forget himself or herself and get totally immersed in God. That applied 100 % to MS.
Gandhi heard M.S. sing and instantly became captivated by her music. Again and again he would ask M.S. to sing some of his favourite Bhajans, which she did with immense pleasure. 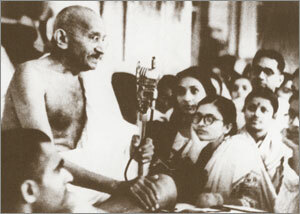 Blessing her, Gandhi advised her to dedicate her music entirely to God and not participate in concerts for money. That marked a major turning point in her life. She quit films – anyway, the films were slowly taking a different turn, totally unsuited to her traditional upbringing. Not only that, she immediately discontinued singing in the standard concerts where she received a remuneration, and instead concentrated on concerts that were intended to raise funds for a charitable cause. Starting from the early fifties, she sang for many years to raise funds for the Kasturibai Gandhi Memorial Fund, and thanks to her talent and reputation, she raised a huge amount. From then on, she never looked back. Barring special-occasion concerts, like when she was elected the President of the Music Academy one year, a sign of high recognition by hardboiled musicians and critics, M.S. sang almost exclusively to spread the glory of God and to raise funds for temples and charitable organisations. For example, she recorded the Venkateswara Suprabhatham, and all the royalty due to her on it go in perpetuity to the Tirupathi Devasthanam. And so on it goes. M.S. was the uncrowned monarch of Carnatic Music. There might have been others better in certain aspects of technical virtuosity, but when it came to voice, depth of rendering and packing the song with Bhava or heartfelt feeling, M.S. was unquestionably in a class by herself. This was tacitly accepted in the music world. And everyone, including the sternest of critics, agreed that where voice was concerned she was unique, like Shakespeare is in literature. While one can go into raptures about the musical excellence of M.S., I would prefer to focus on something which only receives passing mention by others - her simplicity and nobility. She was not merely simple and absolutely humble, but she was also childlike and innocent. I can assure you this was not a put on. She led a full family life as enjoined in the Shastras, representing the best of Indian womanhood. 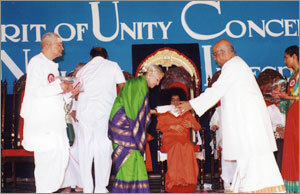 To put it differently, she personified all that Swami says about Indian womanhood in Dharma Vahini – there cannot be any dispute about that. There is an important spiritual point here about the life of M.S. that almost everyone seems to have missed. You see, she provided a brilliant example of Karma Yoga in action. Let us for a moment go back to the Gita. What did Krishna tell Arjuna? In essence what the Blessed Lord said was: “Arjuna, Destiny made you take birth as a warrior, and that is the duty you have to perform. Right now, when Dharma has to be defended, instead of fighting on the side of Dharma, you are trying to talk like a Sannyasi, in order to avoid fighting. This is wrong.” Swami says the same thing: “Like what you are doing instead of trying to do what you like.” Quite naturally and spontaneously, and I am sure also unconsciously, M.S., led the full life of a married woman, serving her husband. Did she become a nonentity as a result of that? Far from it. Quietly and without any fuss, she used her music to reach out to the masses and evoke feelings of Bhakti in them in various ways. Not only that, throughout her life, she taught an object lesson on humility. Few won as many honours as she did but how lightly she wore them! Sadly, even the world of classical music has more that its share of politics, but M.S. kept scrupulously away from it. She had no friends or foes and to her, all were alike; she saw only good in all. In fact, she went out of the way to invite all great Vidwans to her residence and honoured them sumptuously. No wonder all the prominent musicians attended her funeral. In fact, the President, Dr. Kalam, known to be a great admirer of M.S. for years, came specially to attend the state funeral. I should here mention that M.S. received all the honours one could think of including the Magsaysay Award and the highest honour India confers, the Bharatha Ratna, meaning literally, Gem of India. While many such conferments have been criticised, in the case of M.S. there was absolutely no murmur, and no surprise in that. By the way, Dr. Kalam called on M.S. when she was ailing, and when he came for the funeral, he dedicated to her a special poem he had composed in her honour. M.S. took her music seriously and never ceased to practise. She was very good at veena but this was hardly known to the public because she never played the veena in public, except perhaps once many years ago. I must now say something about M.S. and Bhakti because that really was what her music was all about. Reduced to essentials, Bhakti is an expression of Love for God. There are of course many ways of showing Bhakti, and Swami often draws our attention to the nine paths available. But He has also told us that one sweet way is to pour our Heart to Him in song. Unfortunately, not all of us are blessed with a good voice but then, those who are would do well to dedicate that voice to God and His service rather than sell it in the marketplace. In ancient times, musical saints simply ignored everything around them and immersed themselves in music. In the process, they actually created music. The greatest example of that where Carnatic Music is concerned is of course Saint Tyagaraja, who lived roughly two hundred years ago. Swami often makes a reference to Tyagaraja and his music, and has told us many times how Tyagaraja spent almost all his time singing about and for Rama, his favourite deity. In the process, he created extraordinary and pioneering musical compositions. It is to the great credit of M.S. that she used her Divine voice to make Tyagaraja’s compositions alive in the 20th century. When others sang Tyagaraja’s compositions, one admired the musical genius of the composer but when M.S. sang those very same songs, one listened, wept or exulted as did Tyagaraja when he sang for Rama. M.S. alone could evoke those feelings because once she started singing she would just close her eyes and transport herself into an altogether different world, that of Bhakti. That was what really drew even ordinary people to her music. One does not have to know Carnatic Music but everyone can respond to the song of the Heart – and that is precisely what she offered. It is no surprise then that many years ago, she was invited to sing at the Edinburgh Music Festival. This was a revolutionary move on the part of the Organisers of the Festival. M.S. went there and swept the audience off its feet. They did not know a thing about Carnatic Music but they could not fail to see musical excellence in her. It was the same when she sang before the UN in New York. There they were, delegates and representatives from over a hundred countries in the world. The huge hall was jam packed. It was a very special concert, and M.S. had two special songs, one in English composed specially by Rajaji at the instance of Field Marshal K.M. Cariappa, the first Indian Commander-in-Chief of the Indian Army. The song was set to music by Handel Manuel of Madras – very well known locally, especially on account of his connection with All India Radio Madras. Here under this Uniting Roof. is an atom of measureless potential. The other song was one specially composed by the Paramacharya of Kanchi and it was in Sanskrit. Cultivate friendship which will conquer all hearts. Look upon others as thyself. Give up aggression on others which is wrong. Wide mother Earth, our Mother is here ready to give us all our desires. We have the Lord, our Father, compassionate to all. Ye peoples of the World! Restrain yourselves, Give, Be kind. May all people be happy and prosperous. Both songs reflected Indian ethos, the message of oneness of God, the need for a ceiling on desires, a salutation to Mother Earth who provides us with everything, and a prayer for peace and goodwill in humanity. At the end of the concert, M.S. got a standing ovation that seemed to go on and on. She was just not used to that sort of thing! In later years, M.S. did a lot to record famous Slokas etc., and it is no exaggeration to say that it is these recordings that have made many people, young and old, take to the recitation of Venkateswara Suprabhatham, Vishnusahasranamam, Hanuman Chalisa, and so on. By the way, her recording of Vishusahasranamam is the most sold record in human history. Other recordings might have temporarily made it to the top of the charts, but the Vishnusahasranamam being Divine, enjoys continued and undiminished popularity. Bhishma might have given that treasure but it was M.S. who distributed it to humanity. And now a few words about M.S. and Swami. For decades, M.S. and her husband were, like many in Madras, devout followers of the Paramacharya of Kanchi. One fine day, and I have this on good authority, Paramacharya asked M.S. to go Puttaparthi. M.S. was apparently puzzled by this command and wanted to know why she should go to Puttaparthi when she already had a Guru. The Paramacharya simply said: “Go and you will find the reason.” Incidentally, it is interesting that Ramana Maharishi also once sent some of his disciples to Puttaparthi in this same way. So, M.S. came and she instantly knew why she had been asked to come here. Thereafter she was a regular visitor, and sang many times in the Divine presence. 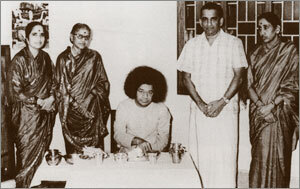 Swami even visted her home in Chennai on many occasions. It was the occasion of the 70th Birthday of Swami, and a concert by M.S. was arranged in the Poornachandra Auditorium. I just could not get in. So I withdrew into the Sai Kulwant Hall, where, fortunately, one could hear the concert via the PA system. I still recall her song “O Ranga Sai” composed by Tyagarajan in honour of Lord Ranganatham, the deity in Sri Rangam. It is a wonderful song in the great Carnatic Raga Kambodhi and M.S. sang it with feeling as only she could. And in a most touching move, she at one point made Ranga Sai into Sathya Sai. And what an electrifying effect that had! to speak. I could sing, but now, even that I am not able to do. How can I speak Swami?” But Swami would not take no for an answer. He went down to where she was sitting, and helped her to walk up a few steps to the porch in Sai Kulwant Hall and took her to the podium. M.S. then said, “Swami, as I just said, I do not know how to make speeches. But if they ask me are you father, I will say you certainly are father. If they ask me are you mother, I will assert that you are indeed mother.” And in this manner she spoke just a few sentences, straight from the Heart. Later a few other ladies made speeches. That evening, when Swami was going round and giving Darshan in Poornachandra Hall before a cultural programme, he told a group of ladies, “Today, so many people made speeches, but the speech of M.S. alone stood out. It came from the heart; all the others were artificial!” That says everything, does it not? I had the good fortune to come into personal contact with M.S. on two occasions. The first was in 1968 and the second was around 1994, here in Puttaparthi. In those days, M.S. used to come here for every birthday celebration. On account of her diet restrictions, Mrs. Srinivasan, the wife of our Physics Professor at that time, used to specially cook food for M.S. and her family and have it sent over throughout their stay. And just before leaving, M.S. would invariably pay a visit to Prof. Srinivasan’s flat in the staff quarters on Samadhi Road. That year, my wife and I were invited to join for lunch. We went and the experience I had was a revelation. M.S. moved just like a simple lady of any ordinary middle-class household. She was requested to sing, and she turned to her husband asking him, what she should sing. She then asked the Professor’s daughters to sing, and as they did, she corrected them many times. In the end she said, “My dears, when you sing, the sound must come from the Naabhi and not from the throat.” This is an important remark and I wish to say a few words about it. Naabhi means navel, and according to Hindu Mythology, Brahma the Creator resides in a Lotus that emerges from the navel of Lord Vishnu. Brahma is not only to be looked upon as the agency for the creation of the material objects in the physical Universe but he is also associated with sound. In practical terms, when someone says the sound must come from the Naabhi, it means that the diaphragm which is below the lungs must push the air out forcefully in producing the sound. Then alone would the sound be rich in tonal quality, besides being loud. To put it differently, both musicians and those who chant the Vedas are always urged to produce sound with full force for achieving grandeur and sonorous quality. This empirical formula has been independently discovered the world over, and it is not surprise that opera singers in the West also do precisely this, though not in obedience to a spiritual injunction. One last M.S. story that would appeal to devotees. Warden Narasimha Murthy is busy preparing the next volume of Sathyam, Sivam, Sundaram, meant to be released next year. In this connection, he has been talking to many old-timers, and one of them was M.S. Apparently, at the end of the conversation, Narasimha Murthy asked, “Do you have any special prayer for Bhagavan?” M.S. smiled and replied, “Where is the question of prayer? Before we even start to pray, Swami is giving all that we want and even more!” What a wonderful reply! It is really not possible to praise M.S. enough. However, there is no need to. Her work does it all for her and it does not require people like me who do not know even the A,B,C of music to offer encomiums. What I am trying to do, perhaps most feebly, is express Radio Sai’s humble tribute. I take this opportunity to inform listeners that with the help of devotees in Chennai, formerly Madras, Radio Sai has been able to obtain nearly 50 CD’s, representing hours and hours of the music of M.S. covering many decades. Our collection includes recording of the famous UN concert. We have sought permission to broadcast these precious recordings from time to time and the clearance is awaited. I am told it would be coming soon. Now that this noble soul has merged into Swami, I am sure that she would be singing for Him always. Volume3 Issue1 Jan 2005 Optimized for Netscape and Firefox. Best viewed in Internet Explorer - 1024 x 768 resolution.